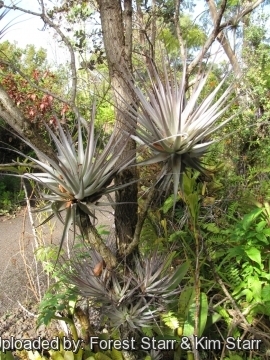 Habit with fruit stalk at Enchanting Floral Gardens of Kula, Maui, Hawaii (USA). March 12, 2012. 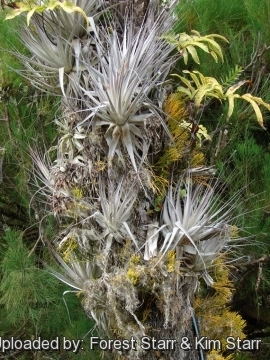 Origin and Habitat: Tillandsia gardneri has a wide geographical distribution comprising Venezuela, Colombia, Brazil (as far south as Rio Grande do Sul), and Trinidad & Tobago. Altitude: From near sea level to 1600 metres above sea level. 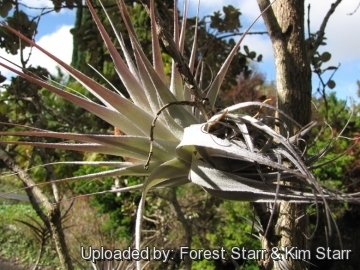 Habitat: Tillandsia gardneri grows as an epiphite on trees and other plants in tropical dry areas but will grow on almost anything. The arched, folded leaves act as collectors for dew or mist. After condensing, the water trickles to the base of the stem, where it is absorbed. This method is so efficient that the plant needs almost no root system. When the plants have roots, they use them to hold on to a perch. Moisture and nourishment enter through the scales on the leaves. Due to its hight ornamental value and low multiplication rate and slow growth this species led to illegal over-collection in the wild to meet commercial demands. 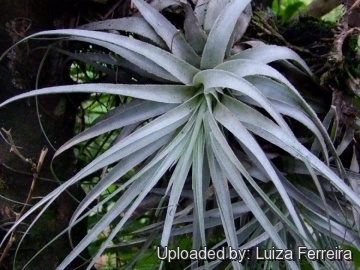 Description: Tillandsia gardneri is an epiphytic perennial species with pretty silvery leaves. Rosette: Small, only 12-25 cm high and wide, with numerous leaves. Leaves: 10-27 cm long, triangular to filiform acuminate, without distinction between sheath and blade, 15-20 mm wide, silvery grey or grey-blue, flexible, lepidote soft and velvety. 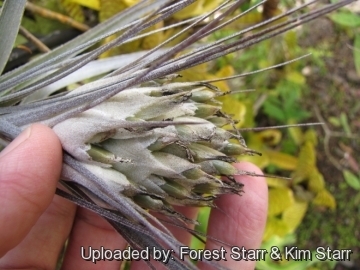 Flowers: Each plant produces 4-12 scapes (inflorescences) also silvery, suberect to decurved and slender, each of which bears 3 to 12 slender, funnel-shaped flowers. The flowers are rosy-red to pale lavender-pink with 3 sepals and 3 petals, with spreading terminal lobes and green-pink floral bracts. Bloomtime Range: Mainly from Late Spring to Late Summer. 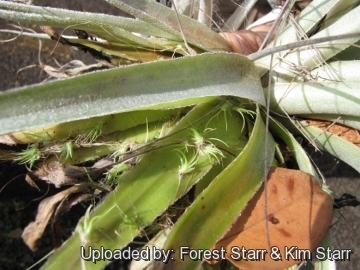 1) Forest & Kim Starr “Tillandsia gardneri (Tillandsia)”. Plants of Hawaii. <http://www.starrenvironmental.com>. Downloaded on 20 August 2014. 3) Wikipedia contributors. 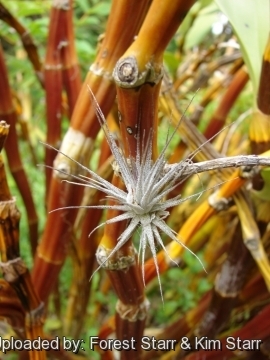 "Tillandsia gardneri." Wikipedia, The Free Encyclopedia. Wikipedia, The Free Encyclopedia, 6 Jul. 2014. Web. 18 Sep. 2014. 6) Smith, L.B. & R. J. Downs. 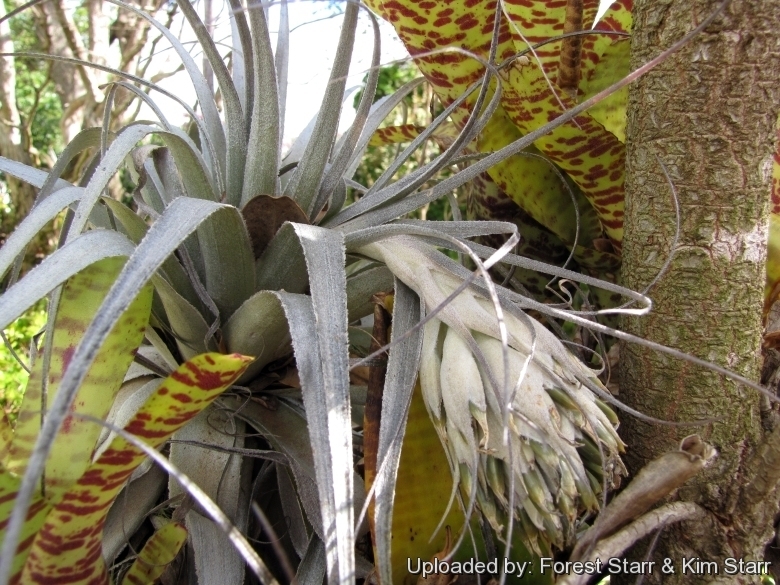 "Tillandsioideae (Bromeliaceae)" Part II. Flora Neotropica, Monograph 14(2): 663–1492 1977. 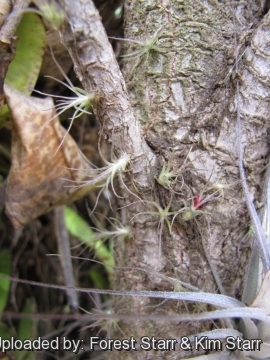 Cultivation and Propagation: Grow Tillandsia in a well ventilated place mounted on wood or grown bare root. They can also be grown on slabs of bark or tree fern fibre. Allow medium to dry out between waterings. Moisture: From mid spring through fall, mist daily and once a month, mist with 1/4 strength water soluble fertilizer. Keep crown filled with distilled water. If grown outdoors, keep dry during winter. Hardiness: USDA Hardiness Zone 9 to 11. These curious plants may be grown outdoors as long as temperatures do not drop below 5° degrees Celsius. pH Range: 5.5 to 7.5. Propagation: Division or seed. The primary plant tends to die off after flowering, but will be replaced by the offshoots. Plants can be divided at any time of the year. Seeds are germinated on peat moss. Seeds need light to germinate.